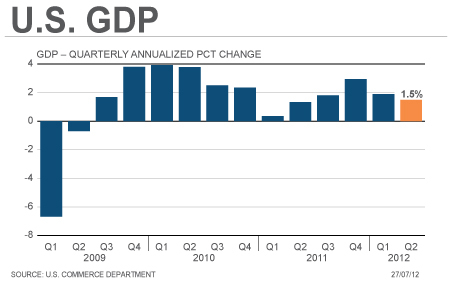 Q2 GDP expanded at a 1.5 pct pace. That’s uninspiring. But government shrank, housing helped a bit and the savings rate ticked up. Emergence from the 2009 recession has been sluggish yet steady. Policymakers might wish otherwise, but they need to adjust to the new normal. U.S. economic expansion slowed as expected to 1.5 percent in the second quarter as consumers spent at their slowest pace in a year. China has no liquidity problem. That’s a problem. The first so-called advance estimate of U.S. GDP in the second quarter of 2012, released by the Bureau of Economic Analysis on July 27, showed an annualized rate of growth of 1.5 percent in real terms. Personal consumption expenditures, a measure of inflation, rose at a 1.5 percent annual rate. Non-residential fixed investment increased at a 5.3 percent annual rate and residential fixed investment increased at a 9.7 percent pace. Inventory changes added 0.3 percentage point to GDP growth and declining government expenditures, primarily state and local government, subtracted a similar amount. The BEA also published revisions for GDP in earlier years. The extent of GDP contraction in 2009 was reduced by 0.4 percentage point, lessening the depth of the recession, while growth the following year was revised downward by 0.6 point to 2.4 percent. For 2011, growth was revised up to 1.8 percent from 1.7 percent.